The WSU mechanical engineering program at Olympic College in Bremerton is a two-year, full-time bachelor’s degree completion program for transfer students. Most courses are taught in person by WSU faculty in Bremerton, and additional courses are taught via interactive video from WSU Pullman, or online through the University’s nationally ranked Global Campus program. The WSU mechanical engineering program at Olympic College in Bremerton is an extension of the ABET-accredited mechanical engineering program at WSU Pullman. Mechanical engineers are in high demand. Businesses throughout the greater Puget Sound area — including the Puget Sound Naval Shipyard and associated facilities in Bremerton — are actively seeking engineers. The WSU mechanical engineering program at Olympic College in Bremerton gives you the scientific and technical foundation you need to be a mechanical engineer in virtually any industry. Students often have several job offers to choose from when they graduate. Apply for admission to WSU at Olympic College, Bremerton as a transfer student. 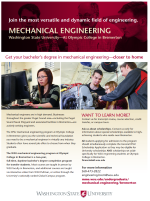 The WSU mechanical engineering program at Olympic College in Bremerton accepts entering students for fall semester only. Admission will continue until all seats for the program are filled. All students must meet requirements as outlined in the WSU Catalog in order to graduate. See the WSU Catalog for degree requirements. Students who are currently certified in the ME major in Pullman should contact the academic coordinator in Bremerton to determine feasibility and eligibility. GPA is a consideration as is completion of the same prerequisites as all other transfer applicants. Evaluation of coursework still needed to complete the degree vs. the schedule of courses offered is another consideration. Do not complete a Change of Campus Form until it has been determined that there is space, prerequisites are satisfied, and that the schedule of courses in Everett will allow timely completion of your degree. Founded in 1946, Olympic College is a public two-year community college that educates more than 12,000 students a year in a wide range of ages and with diverse backgrounds.